In the wake of the election of Donald Trump to the south of the colonial border, there’s been a blooming of discussion on fascism and the necessity for anti-fascist organizing amongst various left-wing streams of thought (anarchists, Marxists, anti-racists etc.). This has only increased in the wake of his inauguration, the subsequent series of worrying (though unsurprising) executive orders that he has issued since taking the office, and the resistance that has flourished against them. Additionally, as I write this from kanada it would be foolhardy to believe that this country is hermetically sealed from what has been going on south of the border. Prominent figures in the race to replace Stephen Harper as the leader of the federal Conservative Party have sought to emulate Trump’s rhetoric, and have even openly called for bringing his message here. Do not forget that before Trump’s executive orders barring immigration from seven Muslim majority countries and authorizing the building of a wall on Mexican border, the late Harper administration passed the nakedly Islamophobic Zero Tolerance for Barbaric Cultural Practices Act, as well as the Anti-terrorism Act, 2015 (Bill C-51) and the Strengthening Canadian Citizenship Act (Bill C-24), two laws which have respectively strengthened the already existing kanadian police state and allowed for the stripping of kanadian citizenship from dual citizens and those with the ability to obtain dual citizenship. None of these are issues that been positively acted upon by the current Liberal Party government of Justin Trudeau. Most strikingly, and tragically, of course, is the recent shooting at the Islamic Cultural Centre of Quebec City. This event, which cost six lives, was carried out by a French-speaking settler who openly espoused support for the right-wing national-populism and Islamophobic politics of Trump as well as Marine Le Pen in France. Many fear that acts such as this could be the tip of the iceberg, rather than some sort of isolated long-wolf type incident. In general, while the emergence of the north amerikan far-right goes back further than Trump, and was certainly emboldened by the election of Barack Obama as the first non-white person to the office of the president, Trump’s campaign and subsequent electoral victory has undeniably led to a marked acceleration of the movement. For the time being, naked white nationalists feel that they now have one of their own in the White(st) House, or, at the very least, someone who will lend them their ear when they come calling and who’s movement they can springboard off of in order to further build their own. I also know and want to recognize, that many people are scared as well of the current situation. As I noted in my commentary on the Trump election, my mother called me at nearly 3 in the morning to tell me that she felt like she was going to throw up in light of. Similarly, my brother, who is generally no liberal, told me that he felt as though he may have to leave his job because of the smothering atmosphere of Trumpian white nationalism in his workplace. Since the election I’ve read what seems like daily updates of the fear, depression and rage felt by many of my fellow Indigenous scholars, and many, many non-scholars, as Trump has re-activated pipeline deals, ordered the construction of a border wall to keep out our Indigenous family from south of the Rio Grande, and hung a painting of perhaps amerika’s most prolific Indian killing president, Andrew Jackson, in the Oval Office. The fears and worries being experienced and expressed by family, friends, colleagues and comrades across Turtle Islaare is palpable, and it would be cold, as well as disingenuous, for me to not give space and voice to those feelings. Centrally Hammerquist sees the danger in a new fascism that is more independent than the classical “euro-fascism” of the 1920s, 30s and 40s, and, seemingly in contradiction with broad left opinion, more oppositional to capitalism. For Hammerquist fascism is not some blunt instrument to be used used as a prop for industrial capitalism but is, rather, a whole new form of barbarism, one that quite disconcertingly comes with mass support. Perhaps most importantly Hammerquist emphasizes the degree to which fascism has its own independent political life, and as such, while it can be influenced by the bourgeoisie, it is ultimately independent of it. For him, fascism is a form of populist right-wing revolution (Hammerquist, 2002). Agreeing with Hammerquist in broad strokes, while also putting forth criticisms and contributions, J. Sakai calls “disastrous” the old “1920s European belief that fascism was just ‘a tool of the ruling class’” (2002: 33). Sakai also emphasizes the class composition of fascist movements, using as his primary case study the German national socialist movement, noting them as primarily formed by men of lower middle class and declassed backgrounds (2002: 34). Sakai has also made interesting contributions to the role of ecological thought, in particular blood & soil doctrine, to fascist, in particular national socialist, thinking (2007). For the colonized, both inside and outside of north amerika, these formulations of fascism are ultimately insufficient. However, in his own reading of fascism, Cope does open up a window onto what I propose is the true heart of fascism. He says: “Geographically speaking, on its own soil fascism is imperialist repression turned inward” (294). This is an aspect of fascism which I believe is essentially missing from other definitions, from the liberal-historical to Dimitrov, to Hammequist & Sakai, from both the pithy and the detailed. In essence, following this line of reasoning, we can say that fascism is when the violence that the colonialist-imperialist nations have visited upon the world over the course of the development of the modern, parasitic capitalist world-system comes back home to visit. So this brings me back to my secondary question, what does fascism mean to the Indigenous person? To the colonized? In particular, as Cope adds that fascism “whilst on foreign soil” is “imperialist repression employed by comprador autocracies” (2014: 294) or even Hammerquist and Sakai’s discussion of the globalization of fascism (2002; 2002)? But what does it mean for an analysis of fascism when being on “foreign soil” is also being in its “own soil?” In other words, what, if anything, can fascism mean to those of us trapped within the belly of a violent settler colonial beast? In the case of the north amerikan settler colony, the sense of exteriority inherent in Césaire’s description of the perfection of what would become fascist oppression within the deployment of colonial violence overseas becomes interior. While for Césaire and Cope the violence of fascism is brought home from the distant colonies of the metropolitan imperialist powers, in the settler colonial context this violence is one that was perfected within the exceptional state of the expansion of the frontier, the clearing and civilizing of Indigenous People to make the land ripe for settlement, and the carceral continuum that has marked Black existence on this land from chattel slavery to the modern hyperghetto. 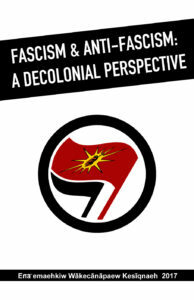 Thus, before one can even begin a discussion of fascism (or even capitalism for that matter[i]), and the possibility of its emergence on this land, it is important to recognize that fascism in north amerika can only occur in a context always-already defined by two fundamental axes of violence: indigenous genocide and antiblackness. These two axes, while being somewhat incommensurable with one another, also overlap, and of course also intersect with the general parasitism of the imperialist countries upon the Third World and other colonized peoples worldwide. Broadly we can say though that both the psychic and material life of white north amerikan society is sutured together by anti-indigenous and antiblack solidarity and violence. Firstly, north amerika is a settler colonial estate. As noted above, this means that one of the principal features that distinguishes north amerikan settler colonialism (as well as the autralasian and israeli forms) from more traditionally theorized metropolitan, or franchise, colonialism is the fundamental drive towards the elimination of Indigenous peoples (Veracini, 2010). This is what the late theorist of settler colonialism Patrick Wolfe referred to the logic of elimination (2006). Indeed for there to even be a kanada or a united states of amerika Indigenous People must disappear in order for non-Indigenous settlers to claim rightful ownership and title over the continent. Further the logic of elimination exists in a dialectic with an extensive project of settler self-indigenization. While this process is most stark in regions such as Appalachia and Quebec (Pearson, 2013) it is pervasive across the continent. Additionally, while much of these processes have taken place juridically, and are daily reinforced within the codes of the civil society of the white settler nation, these processes are, and always have been, drenched in literal Native blood. To define Native life under the existence of settler colonialism is to see it defined through the multiple, converging “vectors of death” arrayed against us, and our resistance to them (Churchill, 2001). All of these processes can be summed up in what Nicolas Juarez refers to as the grammars of suffering of Red life: clearing and civilization (2014). Additionally, while this violence is structural and ontological, it is also enacted in a quotidian fashion by the settler population itself. As Patrick Wolfe notes, there is, from the Indigenous perspective, a fundamental inability to separate the individual settler from the settler state, with the former being the latter’s principal agent of expansion (2016). So what then does fascism mean to us, the colonized, the Red and Black Peoples of this land, from whom it was stolen and who were stolen to work it? What does it mean for us if Trump is indeed a fascist? A proto-fascist? A para-fascist? What does it mean to us if he is one of those things, a right-wing national-populist, or something else entirely yet facilitates their rise and their existence? To paraphrase the African People’s Socialist Party (2015) and Jesse Nevel of the Uhuru Solidarity Movement (2016), and to ask this question more specifically, what does the potential rise of fascism in north amerika mean to Red and Black peoples who have suffered, and who continue to suffer, the hells of genocide, slavery, land theft, convict leasing, forced marches, Jim Crow, popular lynchings, public police murders, corralling and containment in reservations, ghettos and barrios, mass incarceration numbering in the millions, residential schools, economic quarantine and military occupation of our communities? 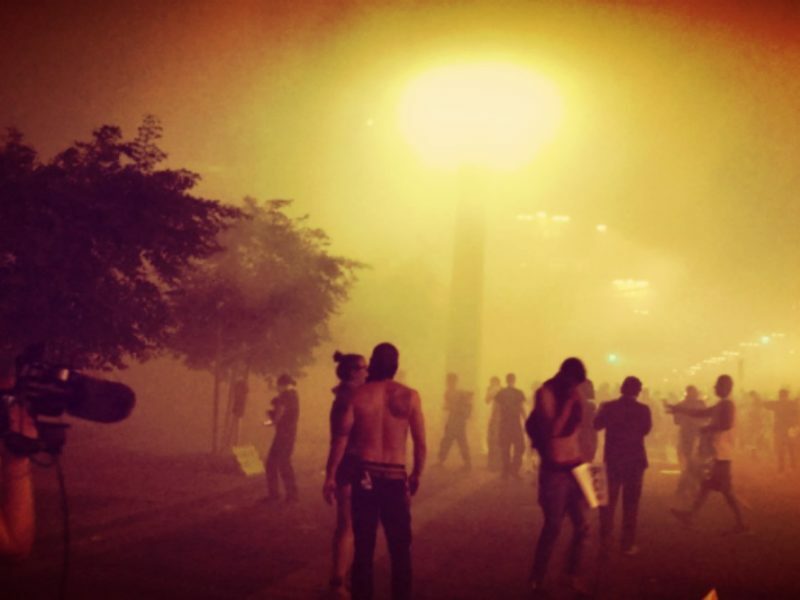 What does fascist violence mean to us as peoples who already face structural processes that seek to drive us to alcoholism, drug abuse, suicide, mental illness and abject poverty, and which, in collusion with the more blatant aspects of our colonial oppression, seek to wipe out Red and Black Bodies? What does fascist violence mean to us when we already live under such states identified by Jodi Byrd (2011) as “unlivable, ungrievable conditions within the state-sponsored economies of slow death and letting die” (38). Ultimately, however, the issue does fold back in on itself, because the fact of the foundational anti-indigenous and antiblack violence of the north amerikan political project is ever present. The basal liberalism of north amerikan political life and civil society has always articulated a war over life and death with two fundamental aims: the elimination of Indigenous peoples and the subjugation and exclusion of Black peoples. In this regard, liberalism and fascism in north amerika are on the same ethical-political continuum, one rooted in settler colonialism and antiblackness. In this regard, from the perspective of the colonized, the distance between a Dimitrovian formulation of fascism as a tool of big business and one rooted in Hammerquist and Sakai that regards it as an altogether different social force begins to lose its importance. And so here we return again to the question of colonial violence in the politic of fascism, because from the perspective of colonized life, whether the governing political logic of the colonial state is liberal or fascist, the fundamental warfare remains in place. The principal threat then of fascism to colonized peoples is not one that we would move from a state of having not been subjected to violence from every angle to one where we would, but rather that the pacing of the eliminative and accumulative logics of settler colonialism would be accelerated. However, this means that in the final analysis the question being posed to Red and Black peoples by our erstwhile white left allies, who right now are sounding the anti-fascist alarm, is an impossible choice between non-fascist, nominally “democratic” colonialism, and fascist colonialism. Not only is this an impossible choice, but it is also, as I have shown, a false one, because what is fascism in the face of gruelling colonial violence without end? At best the choice lies between a slow (“democratic”) and a fast (fascist) colonialism, in which the latter would most certainly accelerate north amerika’s underlying anti-indigenous and antiblack logics. We cannot choose between “democratic” colonialism and fascist colonialism because the ultimate problem is the same: colonialism.